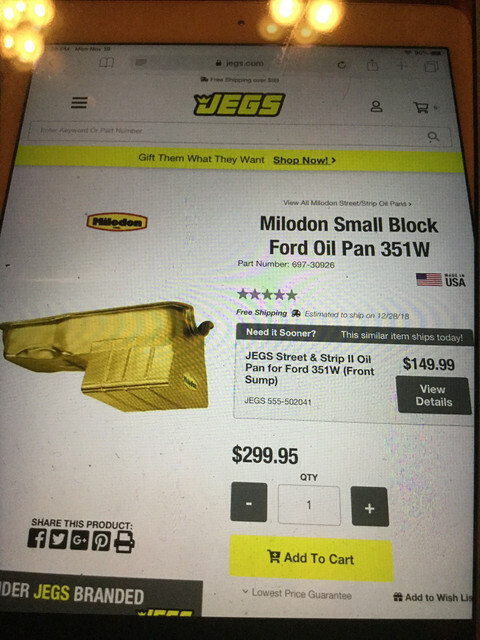 Heading to jegs and ford swap in Columbus this weekend, looking for a 7qt oil pan that fits a 408 Windsor with a main girdle. Anyone have preferences on brands they like or pros/cons on our big bodies? I have a Kevco in my Cleveland. Check their website or call them to see if they have one that fits your application. A T-pan is the way to go unless you are strictly drag racing. The Canton road race pan 15-680 road race pan is problematic at the rear of the sump, as it is within 1/4" of the crossmember and hits under load when the engine torques. I had to remove the rear facing drain plug and block it with a socket set screw. Been using a drill powered pump to change my oil. Not sure if the Moroso 20501 has the same problem, but they are very close in dimension. The regular street T-pan Canton 15-660 or Moroso 20507 have a shorter length sump and should be fine. Probably a good idea to call either company's tech line to verify your girdle will fit their pan, as they are core-based. The Moroso 20536 is a fully fabricated pan and should clear just about any girdle. Also, be careful as there are a lot of cheapie Chinese knock offs that are starting to pop up in the market. They are made with thinner steel and have questionable welding and QC. You can always send a Moroso or Canton pan back to have them leak check or replate, can't do that with a Chinese pan. I also run a Kevko pan. Very happy. 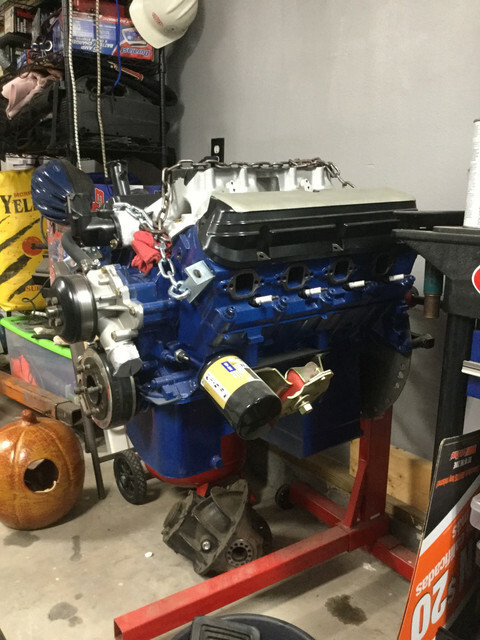 It’s going to be more of a driver/protouring build. Won’t see a drag strip. I’ll check out the Kevko pans, they appear pretty well built. I was looking into the miloden 697-30926 but appears to have a pretty deep sump. 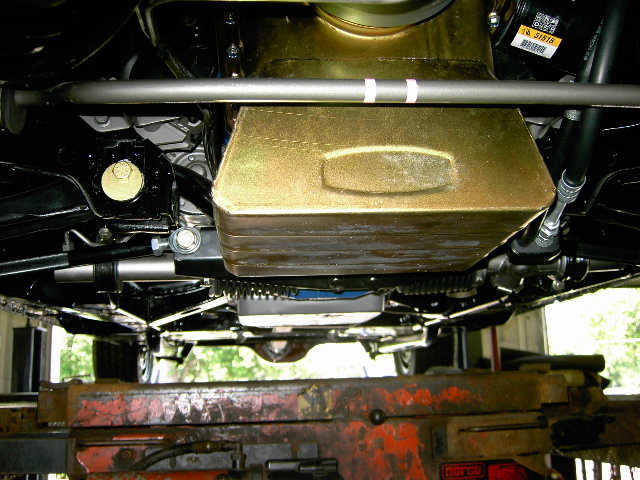 I have the Milodon oil pan as pictured above on my 69 302ci. The only aspect of it I don't like is that the 'Cad' finish wore off within 1000 miles. A couple years ago I taped everything off and painted it with a gold hue engine paint topped off with clear coat. Paint still looks as good as the day it was applied. If I was starting from scratch I would probably get it powder coated. This is what it looked like at 1000 miles. Callled kevko yesterday, he said may have to clearance the scraper to miss the main girdle a little as companies design their girdles differently. Also informed me that this weekend is 25% off online orders so pan and pickup will be under $200.00. Kevco makes good stuff and under $200 is a deal. If you want the plated finish to look good for the duration, you need to clear coat it. The zinc coatings are sacrificial, they wear to protect the metal underneath. Milodon is what the industry calls "Zinc with yellow wash", Moroso uses "clear zinc" now.